Paramount Beauty hosts their annual Runway Show! This week we travelled to Farmingdale, Long Island where Paramount Beauty hosted their annual Runway Show (weekend) where stylists from around the country were able to learn, train, and edify themselves about hair. The event ended with a beautiful and fun runway presentation where models walked the catwalk showcasing the work of all the talent. The models and team arrived early Sunday at the Hilton Hotel where Paramount Beauty hosted the event. The team went right to work on the models. It started with a serious brainstorming session where Christine and her team went over specific details about the cut and color of each model. The team now turned from talking about the work to the work itself on the models. First came the color. Christine’s inspiration and color palette were shades of white, smoke, jade, pine and red. The effect was vibrant and earthy. As the saying goes, it ain’t easy being beautiful. Getting the hair to the required shades took a lot of effort and bleach, and a really long time. After many hours of prepping the hair for the next day’s runway show, it was time for rehearsal. Even the top models and designers have a walk-through to make sure everything runs perfectly for the actual event. It was a really late end to the day. Christine and her team held classes for the show attendees. For this show (and class), Christine wanted to go back to basics. The philosophy that every great haircut starts with a great foundation. More specifically, she educated us on all things bobs. Beautiful bobs with strong lines. The t-shirts the models wore called our attention to this with text. We saw bold hashtags of key words projecting Christine’s definition of the bob. Standouts include #STRUCTURE #TIMELESS #BASIC.FORMS #FRAME and #TEXTURE. After class, the hair was finalized. The make-up artist went to work creating a clean face and eyes, with glittery lips. Christine didn’t want to distract from the clean and bold lines of the bangs, so the intended effect of the makeup was to push back the eyes. They eyes did not take center stage; they almost vanished. Instead, the glitter lips were on full display with the frame of Christine’s perfectly executed bangs. With inspiration deriving from streetwear, the models were dressed in custom/DIY denim and t-shirts, accessorized with leopard shoes. The streetwear was a perfect compliment to the clean lines and color of the hair. The models walked the runway to generous applause. 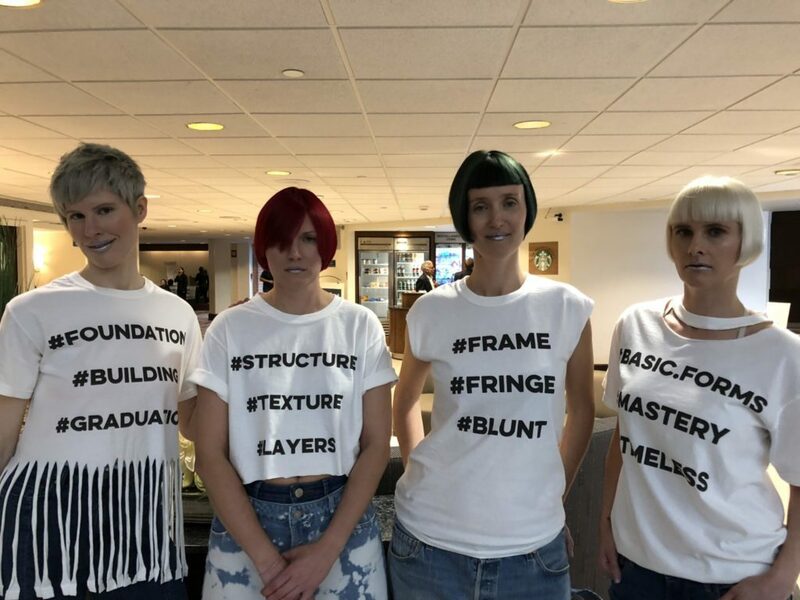 After the models from Salon Concrete/Davines walked, Christine, Leanne and Katie (Davines) took to the stage to talk about the hair. This offered us insight into the intentionality behind the craft and art of the styling. We learned a lot this weekend and had a great deal of fun. We look forward to the event again next year.